File under: Long forgotten. SOMETHING IS OUT THERE was a 1988 US TV mini-series which borrowed liberally from the likes of ALIEN and THE HIDDEN to create a cliched but entertaining piece of rouge body-swapping alien hokum which scored well in the ratings. Having apparently learnt nothing (other than to keep the costs down) from the debacle of V: THE SERIES, NBC immediately rushed a weekly incarnation onto the schedule for later in the year. The mini-series (which - weirdly - was partially filmed in Australia and the States although it was set in LA... and space) paired-off cynical police detective (Joe Cortese) with mysterious (she's an alien!) stranger Mayam d'Abo (of Bond fame) as - predictably - the only two people on Earth who can save the world from the marauding alien. Apparently entirely missing the point, or having looked at what they could afford, NBC played-down the SF angle for the series in favour of typical fish-out-of-water strained humour shenanigans as the two continued to investigate the unusual whilst keeping the obligatory Moonlighting romance on the (exceptionally) slow boil. Viewers - presumably expecting a monster-of-the-week show - bailed and cancellation followed with undue haste. In the UK, the mini-series surfaced first as a rental VHS tape with the two parts spliced together to form one three-hour movie. I eventually acquired an ex-rental copy of the mini from a local video store that was closing down. The tape had been well-loved but it was still watchable. Shortly thereafter, satellite station SKY ONE also aired the two-parter. In those days, multi-channel households were still the exception rather than the rule. No terrestrial British broadcaster has ever aired either incarnation although - I think - the show has (possibly in the last decade) surfaced in reruns somewhere. There's never been a DVD release (or, for that matter, a sell-through rerelease of the mini-series) of either although bootleg copies are in circulation which include episodes abandoned by NBC in their haste to get the show off their schedules but subsequently aired on the US incarnation of the Sci-Fi Channel (note spelling). Personally, I like the mini-series even if it doesn't always make a great deal of sense. I've only seen a few episodes of the weekly and - whilst they pass the time - it's easy to see why audiences didn't stick around for more. 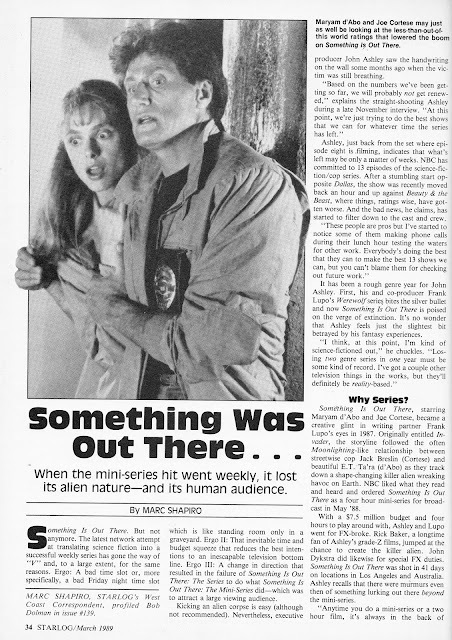 This article from STARLOG MAGAZINE 140 (March 1989) looks at why the show didn't last long.